You are not logged in. [Log In] XT225+250 Rider's Group » Forums » Admin & BBS Related Stuff » Connectivity - PCs, Browsers & OS Help » For those yet to discover Linux Mint 19.1..
Scott’s excellent installation report is particularly informative if you have similar software requirements and you’re upgrading an older laptop to this new Mint release. Linux Mint 18.3 was loaded on all my laptops when Mint 19 was originally released. I installed this first edition of Mint 19 on my testing laptop to see what advantage there might be in moving to this new release. It didn’t take long to discover that the original Mint 19 had a couple of serious bugs. These were not of its own making but inherited from upstream sources out of its control. The fly in the ointment that kept me on Mint 18.3 with my remaining laptops was that Wine, the open-source Windows software environment I use to run a couple of important Windows programs in Mint, was next to impossible to install in a usable manner on Mint 19. Linux Mint 19.1, the revised and updated version of Mint 19, was released the week before Christmas. I upgraded my testing laptop from Mint 19 to 19.1, and found this newest release once again up to the standards that Linux Mint is famous for. The upgrade from Mint 19 to 19.1 was fast and easy. I used the Update Manager in Mint 19 to apply all available updates, then rebooted. Once back in the Update Manager again the Edit menu contained a new item showing the upgrade to Mint 19.1 was available. I confirmed one more time that I really wanted to upgrade. Once I did that the actual upgrade process took only a few minutes to complete on my machine. Once the upgrade completed I rebooted and the Welcome to Linux Mint 19.1 window came up. If this is new to you it’s worthwhile exploring this Welcome window a bit. The First Steps section has some interesting information and provides access to certain useful utilities such as the Driver Manager, Desktop Layout selection, System Settings and Software Manager. These of course are available via the desktop menus, but it’s handy that they're available at first boot as well. Next I upgraded one of my laptops which was still running Mint 18.3. That was more of a chore. The code base for Mint 19.1 is different from 18.3, and that makes the process more time consuming. I've done all my Mint installations with a three partition setup on the hard drive I’m using. This consists of a relatively small partition, approximately 15% to 25% of the drive, assigned to “/” root, then a swap partition equal in size to the RAM installed on that machine, and finally the remainder of the hard drive (the larger part) partitioned as “/home”. Installing Mint 19.1 in place of 18.3 on this setup I used gparted in the Installation Manager to format *ONLY* the Mint 18.3 “/” root partition, leaving the existing “/home” partition unformatted. The installation is essentially from scratch, in that it entirely replaces Mint 18.3 in “/” root with Mint 19.1, while leaving my software and settings in place in the untouched “/home” partition. I do my installations from a USB stick on which I’ve burned Linux Mint 19.1 Mate’. This installation process is absolutely straightforward and easy to complete. Once done it was a simple matter to reconfigure a couple of programs that needed a nudge to get them meshed with the new Mint 19.1 installation. All the rest worked flawlessly as is. The Mate’ version of Mint 19.1 that I use works incredibly well. Installing it the way I do was beyond simple, and after applying available updates through the Update Manager everything worked as it should. Boot time on my machines is quick. Older slower machines aren’t quite as fast so keep that in mind if you’re installing on an older computer. Once a slower machine is up and running you’ll find the performance is actually good. Linux Mint 19.1, given all I know about it first hand, is exactly what Mint users expect from the Linux Mint development team - a solid release which has been careful thought out and developed. Bottom line, Linux Mint 19.1 is genuinely a pleasure to use. If you wonder whether it’s worthwhile to upgrade, or you’re not running Linux Mint at this time and you’re wondering what all the fuss is about, take a moment and read this New Features in Linux Mint 19.1 Mate' document. Think carefully about what is described there, consider how it is written and the time and exceptional care that have gone into the development and distribution process that makes Linux Mint so widely renowned. 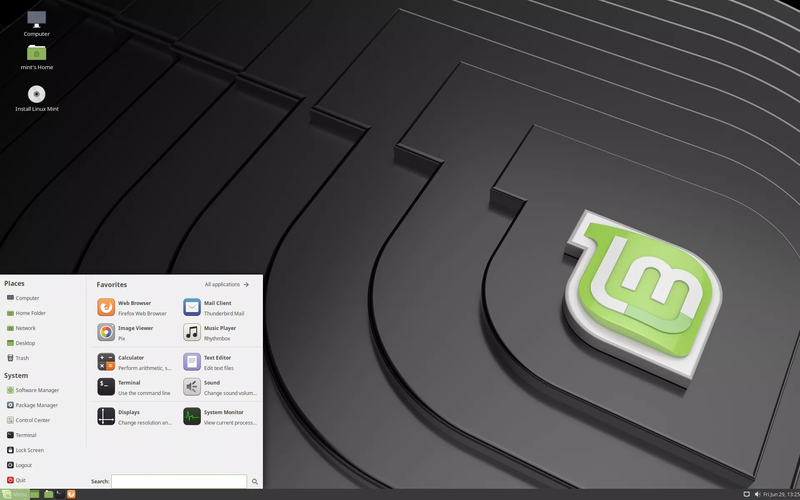 Linux Mint 19.1 is an impressive product in every way, and it shows..
George - Thanks for the information. I dumped my home directory to an external WD Passport drive. Then loaded that in after the O/S was installed. Seemed to work OK with bringing everything over. FileZilla has an export config which is handy. So far things seem to be running well. My main PC is now fully on Mint 19.1 Tessa. Still need to flash an Arduino board. Maybe later today. Still waiting for a few others here to recap their Mint 19.1 experience(s). Not many of us out there. ...Not many of us out there.. True enough, especially if we look in a tightly confined area. However, both at home and across the globe, there's multiple millions of "us (Mint users) out there", with more signing on each day. Here we have a large handful I can think of who've come on board with Mint over time. They may not jump in with 2 cents worth like we do, but on occasion they do make their presence known, and that's good. What there are a lot of, actually 100% of on this site and elsewhere online, are computer users. Whether they use a desktop machine, a laptop, or their tiny 'smartphone' pocket computer to enjoy the site, personal computing and the online technological infrastructure that supports it makes all this possible. Discussions focused on this all pervasive technology we use in a variety of forms every day are of at least passing interest to every XT owner and rider who frequents these pages. To some these discussions are both instructive and encouraging, so no need to despair!.. Yup, I figured it would broaden the forum a tad. We all use a microprocessor based product to participate here. Tried to run the Arduino board IDE software only to find the Linux repository is out of date. Had a bunch of cryptic errors come back and file permission issues with /dev/ttyACMO which is what the board communicates through (USB driver). The software installed fine, it just didn't work worth a damn. Took about an hour to discover I needed to download the software from www.arduino.cc directly. And run its shell scripts to install it. Dealing with Audacity troubles now. Program reports "Can't access target file for writing". Need to run this one down. It's never smooth. You'll get it. You always do! You're a tinkerer and a puzzle solver by nature, making you ideally suited to sorting things like this.. This time operator error. The export file is a bit cryptic so I was trying to write to a USB drive that wasn't mounted. Stupid user! A nice feature in the new Audacity is being able to view and edit meta data in mp3 files. In many car players this data is required for proper indexing of your music for searching. Knew you get it sorted! I have Audacity installed. Like it a lot. Reminds me of the old CoolEdit Pro I once used, only better.. If you're still dealing with rain, snow and cold weather, like many of us in the northern hemisphere are while waiting for warmer days to get out and ride again, (hats off to those in the southern hemisphere this time of year enjoying sunny summer weather! ), and you have time to explore a bit in areas you normally don't put a lot of thought into, now is a good time to pull that old computer out of the storage closet and take a look at Linux Mint as an alternate desktop operating system. Based on the latest version of Ubuntu 18.4x, one of the main differences between Ubuntu and Linux Mint is in the choice of desktop environments that users have to pick from. Ubuntu Linux's main edition offers only the Gnome 3 desktop, while Linux Mint offers users three desktop choices: Cinnamon, Mate' and Xfce, plus a ton of extra Mint only tools and apps that make your workflow easier and more productive. Each of these three desktop choices comes with its own strengths, but beginning users should definitely consider Mate' over Cinnamon or Xfce, which have somewhat more of a learning curve to deal with to get the most out of them compared to the relative straightforwardness of Mate'. Beginning Linux users will feel immediately at home with the Mate' desktop. Linux Mint's developers long ago realized that too steep a change isn’t easy for new Linux users, which is why they went their own way when Ubuntu opted for their now discontinued and highly unpopular 'Unity' desktop. Mint uses universally familiar elements on its Mate' desktop - clickable icons, a “Start” button, a system tray, cascading menus - all the common sense desktop items we started with if we've been computing for any time at all. Those new to Linux, who'd like a desktop environment that immediately feels familiar, will find that Linux Mint 19.1 Mate' is an ideal choice. It's lightweight, needing as little as 512 MB RAM and 9 GB hard disk space to install and run. So you can install it on that older PC you have tucked away somewhere and give it a good test run before deciding to install it on newer hardware, either in place of or running alongside of whatever system you now use. Introducing new Linux users to Linux Mint 19.1 Mate' is a lot of fun! Mint's solid Ubuntu base, little to no learning curve (even complete novices almost immediately 'get it'! ), its comfortable user interface, outstanding selection of default desktop applications, and low hardware requirements allowing users to bring older computers out of storage and give them new life are things you can enjoy which aren't typically associated with these days of Big Brother knows best desktop computing. Download Linux Mint 19.1 Mate' (no worries, its entirely free! ), burn the .iso image you've downloaded to a DVD or a USB stick, set your computer's bios to boot from the media you've created, and in short order you'll be introduced to all the goodness Linux Mint has to offer in its latest and greatest desktop OS release!